Dear dog lovers, please see the text under the following object description. The object is basically only in the time from 01. May to 30. September and only book for this period. Long term rental is not possible. My rental prices are exclusive fee for apartment. Your four-legged friends are welcome to me. For the sake of the health of our guests, I ask you to follow the rules below. The dogs are not allowed to sleep in the beds. collect and dispose of in the trash can. There is a duty of supervision on the part of the dog owner, but no leash control for the dog (s). Dogs must not hunt wild animals on the property, especially in the shore area. Entering the reed areas is forbidden for humans and dogs. For the increased by dogs cleaning costs I charge each dog and stay flat rate 10, - Euro, to be paid in cash on the day of arrival. Diver and coot live on the property also wild Canada and Nile geese in varying numbers. 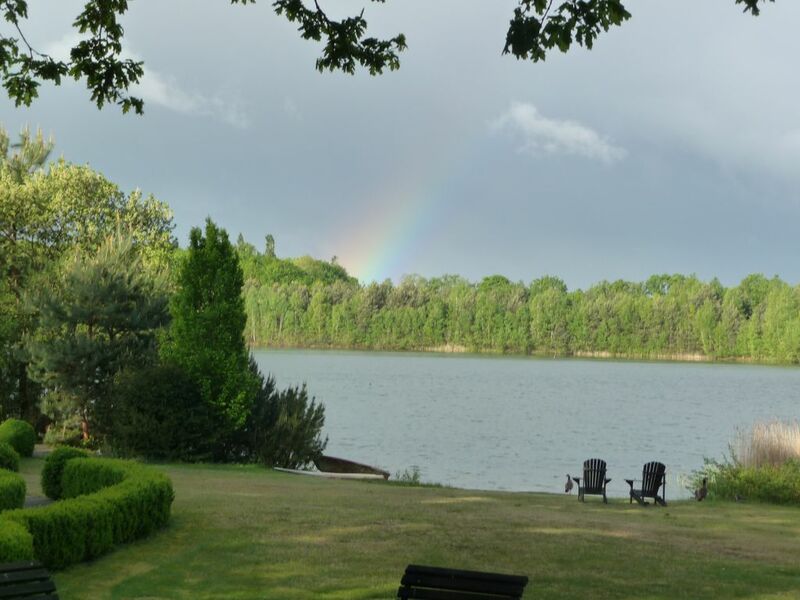 The holiday home including the lake and lakeside area are part of the Great Baggersee Westrittrum, which is fully privately owned, while the Kleine Baggersee is owned by the Community and public. This was the best and most relaxing holiday we have had for years. The house is beautifully presented, very comfortable and has lots of extras. We slept well as the bed was of a good quality. There was so much space to sit and read or watch TV. On rainy days it was good to go to the spacious garage and play table tennis. The garden was extraordinarily beautiful. So many places to sit and relax, and the swimming lake was unbelievably good. Our dog, Charlie, was made especially welcome and had the most enjoyable time. We appreciated the breakfast rolls Inka brought round every morning and the welcome package was very generous. Thank you Inka for a perfect holiday, we will definitely be back! Vom ersten Moment waten wir verzaubert von diesem Fleckchen Erde! Das mit viel Liebe eingerichtete Haus ließ keine Wünsche offen und der Blick auf den See und den grandiosen Garten ließen uns täglich staunen! Ebenso bedanken wir uns bei Frau Linz für ihre herzliche Art!!! Wir werden garantiert wieder hier Urlaub machen! Martin & Heike mit Heinz 🐕! Es war eine wunderschöne Woche die mit dem herzlichen Empfang von Frau Linz gestartet ist. Das Haus mit dem Garten ( Park ) ist traumhaft gelegen. Die vielen verstreuten Sitzgelegenheiten laden zum entspannen und genießen ein. Dazu noch die herzliche Art und Weise der Vermieterin Frau Linz lässt keine Wünsche offen. Wir kommen bestimmt wieder. Für Menschen, die Entspannung und Ruhe suchen. Municipality Großenkneten and is public.